Bifurcated fans are used to exhaust a wide variety of hot gases, paint fumes, smoke, steam and dust in suspension. For exhausting hot gasses, paint fumes (excluding, cellulose), steam, smoke and dust laden air, available in diameters 250-1250mm. Normal Temperature – upto 80°C (176°F). Constructed in mild steel with a polypropylene impeller and Class F insulation motor. Special corrosion- resistant finishes available. Standard finish - Galvanised. High Temperature - upto 200°C (392°F). Constructed in mild steel with an aluminium impeller and Class F insulation motor. Special corrosion- resistant finishes available. Standard finish - galvanised. Standard three or single phase motors can be fitted along with ATEX ZONE 1 or 2 and company specification units when required. 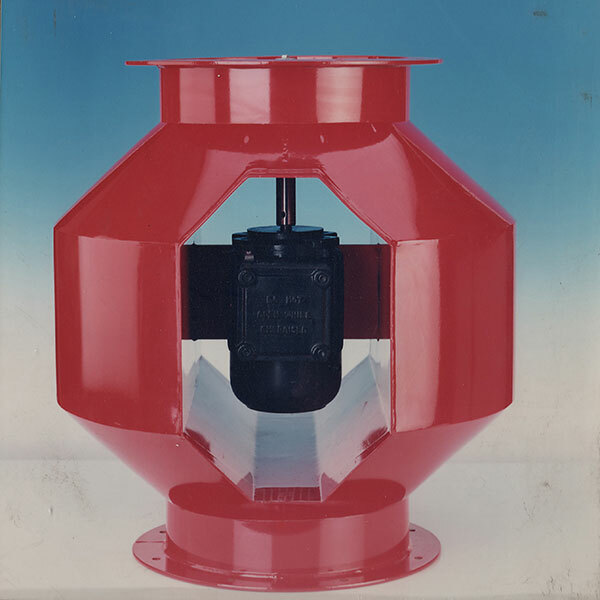 This range of fans can also be constructed from rigid PVC sheet reinforced with fibreglass and suitable for a wide fans of uses in the chemical industry and in the extraction of acid fumes from industrial processes. Dimensions and performance data as for normal Bifurcated fans. Ideal for use in the catering industry for air temperature upto 80°C (176°F). For exhausting warm air and steam. Constructed throughout in stainless steel with a polypropylene impeller and Class ‘F’ standard motor with a stainless steel extended shaft. Uses mainly in the chemical and allied trades. Suitable for most acid vapours upto 80°C (176°F). Constructed throughout in stainless steel with a polypropylene impeller and Class F standard motor with a stainless steel extended shaft.